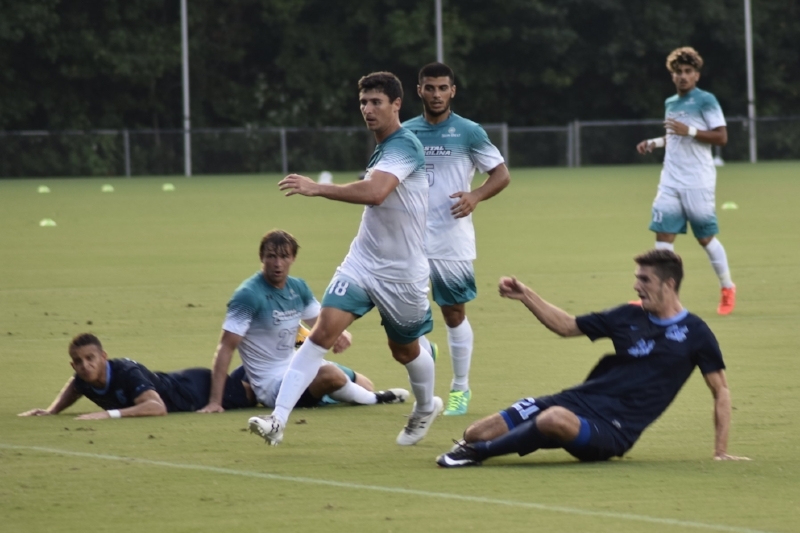 Carolina and Coastal Carolina kicked off the season with an exhibition match Sunday evening. The Tar Heels tossed mini soccer balls into the crowd after their introductions. Zach Wright's nifty playmaking led to the game-tying goal . . .
. . . scored by freshman Alex Rose. Pieters knifed through defense to score the go-ahead marker 12 minutes into the second half. Not ten minutes after his goal, Peters set up Rose for the Tar Heels' third of the night. Rose's second goal was the final tally in the Tar Heels' 3-1 win. CARY – The No. 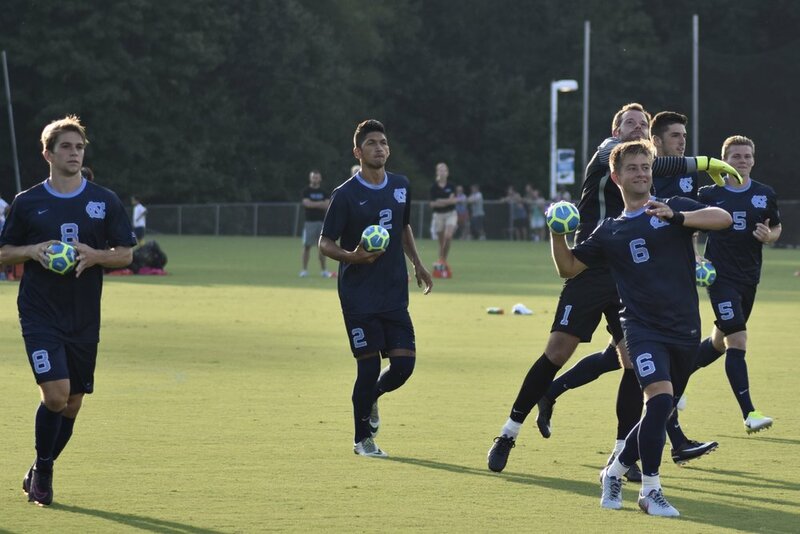 4 Carolina men's soccer team got the 2017 season underway Sunday night with a 3-1 win over No. 19 Coastal Carolina. 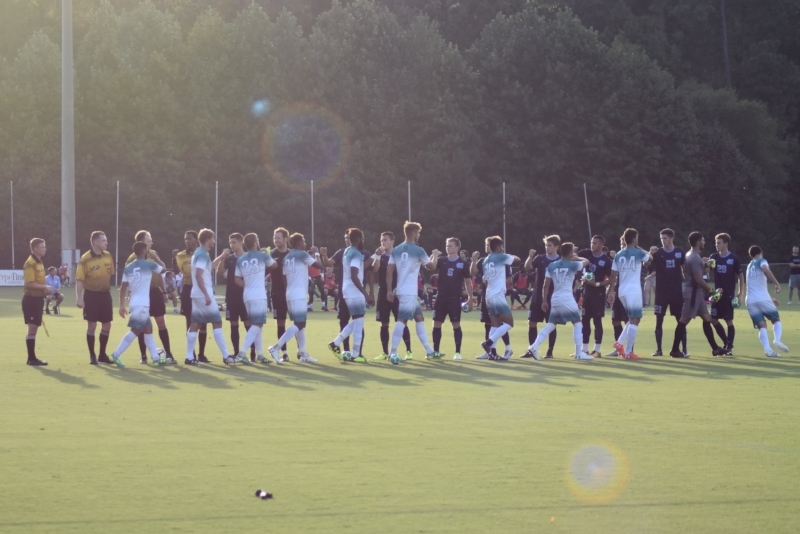 The Tar Heels controlled the run of play for the better part of the game, but it was the Chants that got on the board first when a Coastal Carolina run-out led to a surprise early goal. 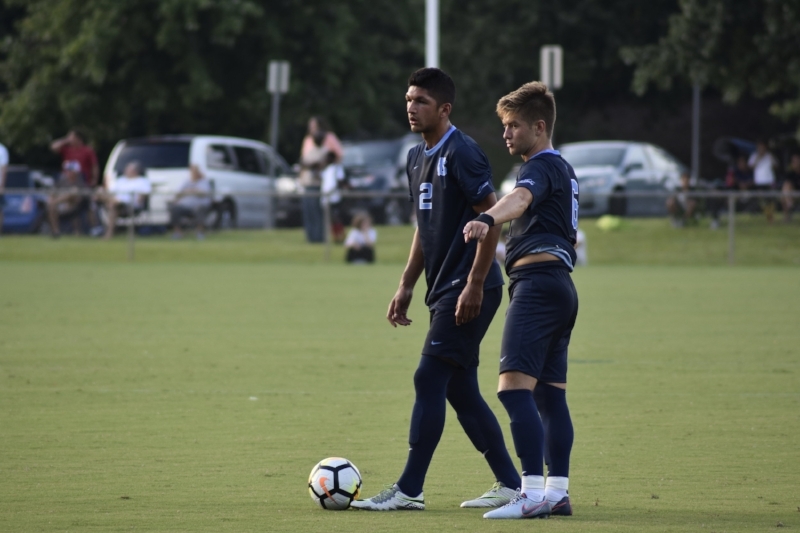 The Tar Heels, however, struck back quickly as senior forward Zach Wright knifed down the right side of the field and found freshman Alex Rose, who put the ball past Coastal keeper Braulio Linares-Ortiz. The tying goal came 15 seconds after Coastal opened the scoring. 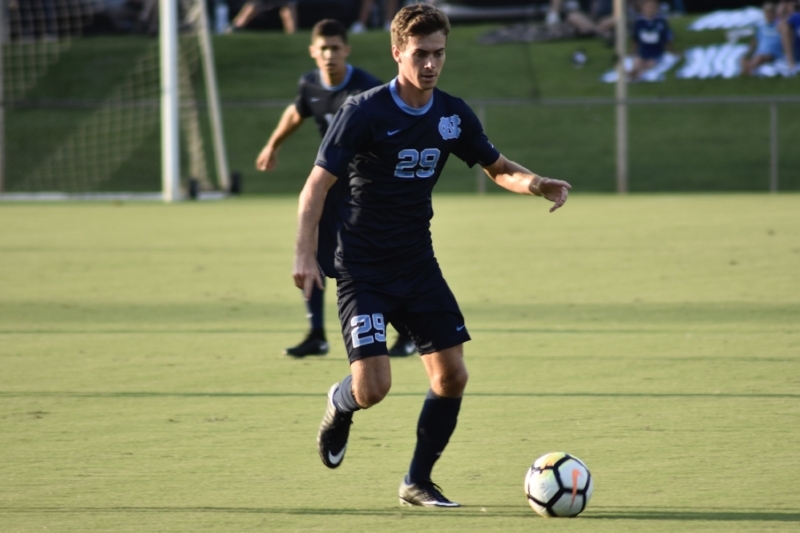 The Tar Heels had been getting chances early, and they happened upon the right combination at the right time to take back the momentum of the match. "We just try and continue to do the right thing," said senior midfielder David October. "We try not to get fazed by plays. If we go a goal up, it doesn't faze us. If we go a goal down, it doesn't faze us, and that's something that's part of our culture here. We just want to be focused on the things that we're trying to do. That play happened to work out straight out of the goal . . . we don't get caught up in the emotions of plays, it's just really important to be focused throughout the game, regardless of the score." "I think that comes from the returners. I think the returning guys set the tone," said Tar Heel head coach Carlos Somoano. "I know 'Rosey' scored it, but I think that's where you see a little bit of competitive juices-type of response. It's more than just an exhibition, it's like, OK, we goofed up here, we've got to kick it to another gear." Carolina's Jelani Pieters scored early in the second half on an assist from Cam Lindley to take a 2-1 lead, then ten minutes later he connected with Rose for what would be the game's final goal. In his first game as a Tar Heel, Rose led his team with two goals and four shots, three of them on frame. "The guys made my job easy," he said. "All I had to do was just tap in the ball. It was pretty easy." For the most part, Rose's opportunities came when his forwards on either side, Wright or Peters or Alan Winn, advanced the ball, and he found space in the middle. "That's what Carlos wants from me," Rose said. "He just wants me to make those runs in behind, and that's what my game is. My game's not going to hold up the ball. I'm a skinny guy, but keep working hard and get those tap-ins from those guys out wide." "He's a good fit for us in that position for us right now," Somoano said of Rose. "He really only wants to do one thing, and that's score, and that's a good thing if he can do it. And when he does it, obviously that can help us quite a bit." Carolina's game with the Chants marked an early preseason test. Though the Tar Heels are ranked high, a daunting schedule awaits. But an exhibition like Sunday's helps set the foundation for moving forward into the regular season. "It's just a fantastic opportunity to progress and help develop the things we've been working on in training," October said. "It just give us a better sense of what the big picture is, overall," Somoano said of the exhibition. "I don't think in these preseason games or at anytime, you should get too excited or too disappointed in the goods or the bads. You just take what they are, try to identify what they are and then go back to the drawing board and keep working." Carolina has one more exhibition match, this Thursday at South Carolina, before hosting Providence on August 25th at Elon's Rudd Field in the season opener.